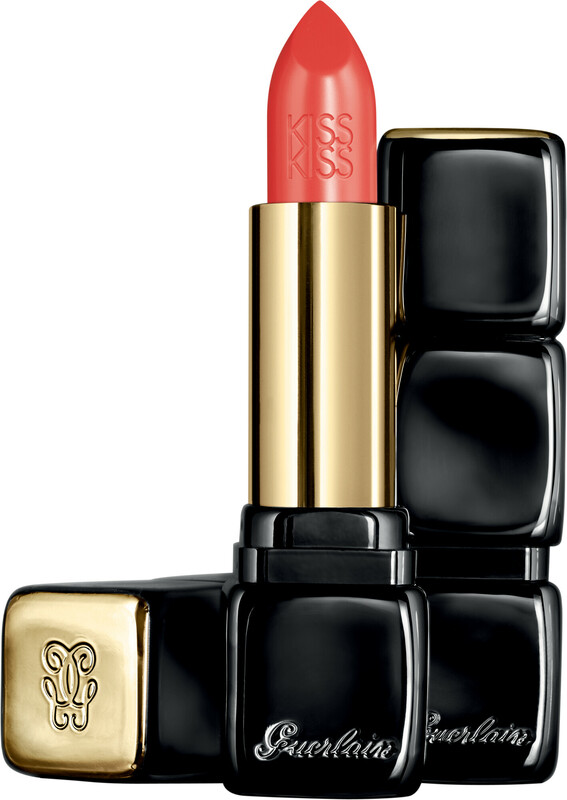 GUERLAIN KISSKISS Creamy Shaping Lip Colour is a precious talisman for an elegant lip look, created for those who long for a perfected, couture finish. KISSKISS is the lipstick equivalent of a little black dress: timeless, beautiful and in perfect harmony with feminine curves. Its creamy texture smoothes and hydrates lips, dressing them in medium coverage, satin effect colour. Lips regain their fullness and softness thanks to a formula enriched with plumping hyaluronic acid spheres, while mango butter commiphora oil intensely smooth the lip surface for a perfected look. A subtle vanilla and violet fragrance sweetened with the scent of berries creates a moment of pure pleasure upon application. For flawless lips, indulge in the full KISSKISS routine. Begin with the KISSKISS Liplift lipstick primer for perfect smoothness, and then apply the KissKiss lipstick directly to lips. DIISOSTEARYL MALATE, JOJOBA ESTERS, BIS-DIGLYCERYL POLYACYLADIPATE-2, ISOSTEARYL HYDROXYSTEARATE, POLYETHYLENE, SYNTHETIC FLUORPHLOGOPITE, MANGIFERA INDICA (MANGO) SEED BUTTER, OCTYLDODECANOL, PENTAERYTHRITYL TETRAISOSTEARATE, CERA MICROCRISTALLINA (MICROCRYSTALLINE WAX), SILICA, HYDROGENATED STYRENE/METHYL STYRENE/INDENE COPOLYMER, ETHYLHEXYL PALMITATE, OZOKERITE, CAPRYLIC/CAPRIC TRIGLYCERIDE, PARFUM (FRAGRANCE), COMMIPHORA MUKUL RESIN EXTRACT, BHT, TRIHYDROXYSTEARIN, BUTYLENE GLYCOL, CAPRYLYL GLYCOL, PROPYL GALLATE, PHENOXYETHANOL, SODIUM HYALURONATE, HEXYLENE GLYCOL, TOCOPHEROL, [+/- MICA, CI 77891 (TITANIUM DIOXIDE), CI 77491, CI 77492, CI 77499 (IRON OXIDES), CI 15850 (RED 6, RED 6 LAKE, RED 7, RED 7 LAKE), CI 15985 (YELLOW 6 LAKE), CI 19140 (YELLOW 5 LAKE), CI 42090 (BLUE 1 LAKE), CI 45380 (RED 21 LAKE), CI 45410 (RED 28 LAKE), CI 73360 (RED 30 LAKE), CI 77163 (BISMUTH OXYCHLORIDE), CI 77742 (MANGANESEVIOLET)]. GUERLAIN KISSKISS Creamy Shaping Lip Colour is rated 4.8 out of 5 by 13. Rated 5 out of 5 by jasmine65 from love guerliain lipsticks the packaging is very pretty, I love the texture, very smooth and moisturized. Rated 4 out of 5 by Gussy from Perfect Pink I love the colour of this lipstick though the texture is a bit strange. It is the perfect pink for my skin tone and certainly seems to help the feel of the lips. I just wish I could get the colour to stay on a bit longer! Rated 5 out of 5 by sari93 from My Favourite Lipstick! My lips are pretty dry so I am very happy to have found Guerlain Kiss Kiss lipstick. They are hydrating and come in many shades, I have them in almost every colour!